Teachers, before completing this science lesson plan, please be sure that your students understand what small solar system bodies are by using the Small Solar System Bodies Lesson Plan included in this series. Once students understand the concept of small solar system bodies, continue on with the Interplanetary Dust Lesson Plan as well as the other lesson plans in this series. Once students understand what interplanetary dust is after you define it to them as very small solid particles that are referred to as interplanetary dust or micrometeoroids, move on to the next portion of the lesson plan. Explain to students that these particles can be seen with the naked eye. Then, download and print the example photograph of interplanetary dust on the zodiac line that is included with this Interplanetary Dust Lesson Plan. Allow students to observe the photograph and discuss times they themselves may have seen interplanetary dust. Then, complete the activity described below. Complete this activity using a simple flashlight and a darkened room to give a clear, hands on example of how interplanetary dust works in our atmosphere. Pull the shades and shut the lights off to make this activity easier to complete. It does not have to be completely dark, but the darker it, the easier it is to see the results of this interplanetary dust activity. Sit in the circle with the flashlight above your head so as not to block the view of any of the students. Explain to students that the sun reflects off of interplanetary dust in such a way as to make sparkles of light in various colors. 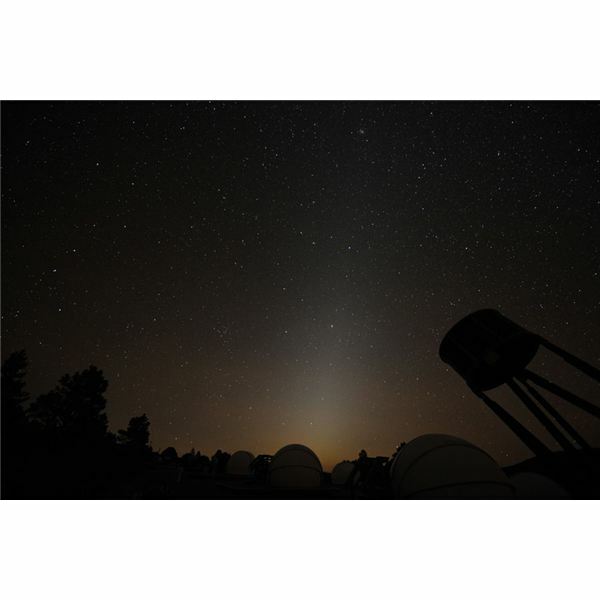 Further explain that this phenomena is easily seen on a clear night just after sunset as well as just before sunrise.The name of this phenomena is zodiacal light. Let them know there is a more difficult phenomena to see called Gegenshein and it occurs in the opposite direction of the sun. Turn the flashlight on and ask students to observe the dust in the light. Explain how this is similar to dust in the atmosphere surrounding the Earth. Discuss this phenomena with students. After completing this activity, students should be aware of what interplanetary dust is and why it exists in our atmosphere. You may want to discuss pollution with your students and how it may effect interplanetary dust.